Grace Century have continued their support for the Ras Al Khaimah Animal Welfare Center into a 2nd year, sponsoring their fundraising event to take place on November 13th 2015. The RAK Animal Welfare Center is a charity dedicated to supporting, caring for, and re-homing lost or abandoned pets in the Emirate. Ras Al Khaimah, United Arab Emirates, October 19, 2015	(Newswire.com) - ​​Private Equity and Research company Grace Century has announced its continued support for the RAK Animal Welfare Center and its sister organization, RAK Feline Rescues, for the second consecutive year. On November 13th, 2015, RAK Animal Welfare Center will host a fund-raising event under the banner of “A Beach Pawty Fur a Great Cause”, which will be attended by Center supporters, donors and sponsors, many have whom have donated items for silent and live auctions which will take place on the night. The event will take place at the Five-Star Cove Rotana Resort Hotel in Ras Al Khaimah. In 2014, the event proved to be successful, raising in excess of 40,000 AED ($11,000 USD). This year they are aiming to reach 100,000 AED ($27,000 USD). The RAK Animal Welfare Center is supported by the Government of Ras Al Khaimah and opened its doors in January 2010. The Center has since grown into a hub of excellence for animal welfare, thanks to the help of their staff and volunteers. Faye Hollands-Meadows, Founder of RAK Feline Rescues echoes their sentiments, “Thanks to support such as that from Grace Century, we are able to continue our work rescuing abused, abandoned and injured animals. RAK Feline Rescues is dedicated to educating pet owners on animal care and animal welfare in the UAE. 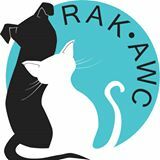 www.rakawc.com is a nonprofit animal welfare organization that re-homes socialized, trained and healthy cats and dogs. They also offer a one-stop shop for all pet needs including a veterinary hospital, boarding and pet shop. RAK AWC is located in the Al Qusaidat district of Ras Al Khaimah. The shelter contains a dog building with 28 indoor and outdoor kennels, a cattery with 15 rooms. Additionally, animal housing includes various outdoor areas. The facility also consists of the administration building with an office, clinic, pet shop and an adoption room, in which animals and their potential future owners have time and space to get to know each other. The shelter also has two outdoor dog run on its ground, where all the dogs are able to run off-leash, socialize and enjoy life as a dog. Recently the Center has experienced some structural changes and now functions under RAK Government Public Works and Services Department (PWSD). As such, being part of PWSD and receiving their extended support enable RAK AWC to continue its work toward improving animal welfare in the emirate and to always strive to achieve the best in the services they provide. RAK Feline Rescues strives to achieve a high level of animal welfare in the UAE. Their vision is a world where all pets are family members in loving homes for LIFE. They aim to find the right home for each animal in their care and endeavor to support and advise anyone who needs help in caring for their pets. RAK Feline Rescues’ mission is to rescue unwanted & lost animals, provide temporary shelter & care, find secure & loving homes, provide advice, support & guidance for pet owners & increase the public awareness of their responsibility towards animal welfare. Their combined missions are to improve the welfare of all the animals in Ras Al Khaimah.